Two weeks tomorrow I shall be heading up to Cambridge for the weekend. I’ll spend most of Saturday being a tourist; Cambridge is a place I’ve yet to visit before, so I’ll be taking the opportunity to look around this historic city which dates back to Roman times, yet also hosts ‘Silicon Fen’ a hot bed of modern technological progress. Cambridge is an historic university city. Of course, Cambridge itself is the backdrop to a long anticipated event. Originally pitched back in 2012 as a ‘Launch Party’ for Kickstarter backers, Frontier Developments has recently announced that Elite: Dangerous will be celebrated by a ‘Premiere’ event, perhaps along the lines of a new film launch. Frontier has hired the Imperial War Museum at Duxford for this, and set the tone with an appropriately minimalist invitation. 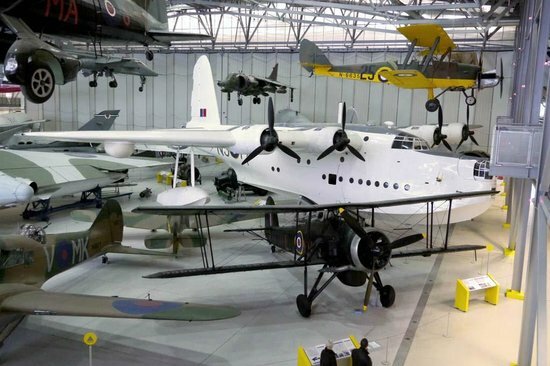 This looks to be a fascinating place in its own right, boasting a collection of static aircraft displays, a working runway and many exhibition halls. Duxford also has a ‘Pre-Production’ model of the supersonic airliner “Concorde’ on display. Concorde – A beautiful aircraft, no sadly no longer flying. I think you’d agree that this was a pretty special, and quite appropriate, venue for the launch of a computer game focussed primarily on the flight and combat capabilities of a futurist spacecraft. The Cobra Mk3 looks quite at home alongside the various historic aircraft on the invite. There was a little consternation when extra tickets became available on the Elite: Dangerous store, as the number of attendees, measured in the low hundreds from the Kickstarter pledge tiers, appeared to be increasing quite dramatically. My view on this was simple. The more the merrier – restricted only by the size of the venue. There’s nothing worse than not having enough people, and the extra tickets gave the opportunity for some of the notable fans, who missed the original Kickstarter and that have appeared over the last two years, to come along as well. That those who really care about the game get a chance to be present at its Premiere makes perfect sense to me. Having played a small role in the overall ‘Elite’ story, I’ll be looking forward to meeting the Frontier team again, seeing old friends from before the ED days, meeting some of the newer fans and making new friendships at the same time. Many of the Elite authors will be present too – we’re quite good at partying. We’ll be doing something with our books too, details to be confirmed. Mostly (harmless?) I will be looking forward to seeing the latest build of Elite: Dangerous on as bigger screen as possible. The best I can manage at home is my 1080p TV, so I’m hoping that Frontier will go to town with some 4K loveliness along with a selection of Oculus Rifts (Oculii Rift?). Elite: Dangerous at EGX. I think we can be confident they’ll put on a good show. Frontier have hinted at some celebrity attendees, we’ll have to wait and see who they might be. They’ve also promised some ‘Significant Announcements’. Speculation is, of course, rife that this will be the actual launch date for the game. Since we already know that this is due in 2014 (and there’s not much left of that now) I wonder if they have something else up their sleeve. They do tend to play their cards close to their chest, something I heartily approve of. So, if you’re going to be at the Premiere, make sure you find me and say hello. I’m looking forward to meeting Elite fans old and new. Docking permission granted. Right on, Commanders! I really hope you kids don’t trash that nice place with your partying. I’m expecting Frontier to put on a good show, personally i’ve been waiting for a sequel to First Enounters (elite III) for 20 years….